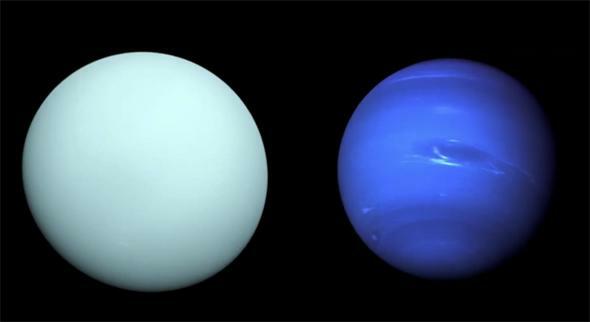 Crash Course Astronomy: Uranus and Neptune. I’m not gonna lie to you: This is the best cold open of any episode we’ve done so far. I made myself laugh writing it. Before you comment, PLEASE READ THE FOOTNOTE ON THIS ARTICLE. And if you still feel the need to comment, remember, neither you nor I is funnier than Futurama. About that pronunciation, this may help as well. UPDATE, May 29, 2015: ARG! I made a mistake in the video; I said the rings of Uranus were discovered in 1997, but they were discovered in 1977. It was a typo in the original script and it somehow made its way to the video without any of us noticing. Aggravating. My apologies for any confusion. I’ve also written about those giant storms that erupted in Uranus’ atmosphere, an odd hypothesis about why the planet is tipped over, and an interesting claim that Herschel may have seen the rings of Uranus! As for Neptune, some articles that might interest you: a new moon found by Hubble, a celebration of the completion of one Neptunian orbit since it was discovered in 1846 (including some lovely Hubble pictures), that time the New Horizons Pluto probe saw Neptune and Triton, and what I consider the single finest picture of Neptune that exists. Also? Neptune is really far away.